Advice on Grading Coins, Coin Grade Range, Coin Grading Companies, and More! Grading coins accurately is one of the most valuable skills a numismatist can learn. What exactly is meant by grading coins, and why is this important? “Coin Grade” is an expression used within the coin hobby to indicate the condition, or amount of wear on a coin. The grade is important, because after rarity and demand, it is the most critical factor determining the coin value. Generally speaking, the higher the grade of a coin, the greater the coin value. Developing a working knowledge of the art of coin grading is one of the first and most important steps in becoming a successful numismatist. The "Coin Grading Tools HERE" link at the upper right opens a new window that lists tools critical to developing accurate coin grading skills. This page includes a summary on the evolution of grading coins, coin grading basics, general advice, the role of the coin certification companies, as well as additional recommended resources. Use the links directly below to navigate quickly through this information. Who are the Coin Grading Companies Today? The science of grading coins is not the same as the science of physics or mathematics, where formulas yield an answer “Z”, given inputs “X” and “Y”. 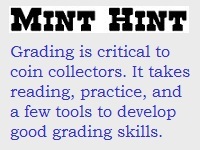 No, grading coins with great precision is a talent, resulting from the nexus of knowledge, experience, and practice. Fortunately, the novice coin collector need not be intimidated by the subjectivity aspect of grading coins. Any person, even a newcomer, can develop enough skill and confidence to approximate the condition of nearly any coin, through diligent reading and studying as many coins as possible, whose conditions are already known. The first step in gaining a clearer understanding of how to grade coins is to acquire the “bible” of grading coins, the Official ANA Grading Standards for United States Coins . Written by longtime veteran numismatist Kenneth Bressett and produced by the American Numismatic Association, this valuable reference is the foundation upon which all other coin grading books are written, and deserves a place in the personal libraries of all coin collectors. We strongly recommend it, especially for people wanting to learn the basics. Full Review here. An important sidekick publication, Photograde , is also recommended. Designed for beginners and advanced coin collectors alike, every regular issue United States coin type from 1793 to date is illustrated, many of them enlarged to show greater detail. For an detailed look at what Photograde has to offer, we have an online review (18th ed.). Both these books are world class, and are the only books you will ever need to purchase on the topic of grading coins. If you’re looking for an excuse to travel to Colorado anytime soon, consider the American Numismatic Association’s “Grading US Coins” seminar. The course consists of reviewing ANA grading standards, hands-on practice, slide presentations, and more. For lack of a better description, this is a “crash course” on becoming an expert at grading coins. Check out the ANA's Educational webpage for course schedules. Another top-of-the-line coin grading book worth recommending is The Official Guide to Coin Grading and Counterfeit Detection The Official Guide to Coin Grading and Counterfeit Detection, Edition #2 . The book was produced by the grading experts at Professional Coin Grading Service, better known as PCGS, and edited by coin collector "Superman", Scott Travers. PCGS is one of the oldest third party coin certification companies, beginning operations in the 1980's. It is regarded by most collectors and dealers alike as one of the best grading services of all. Their many years of experience are distilled into a single, compact volume, and is laden with essential information designed to graduate the ordinary collector into the realm of advanced numismatist. Click here for a review of this valuable reference. 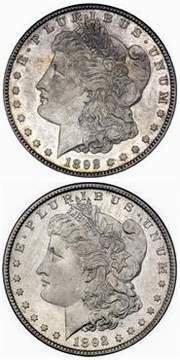 The importance of grading is magnified by the case of the 1892-S Morgan silver dollar. The first 1892-S above graded AU-58 because of slight wear above Liberty's ear. The second specimen, with no wear and only a few scratches, was judged as an MS-65 grade. To the uninformed, there may not appear to be much difference between the two, but in the open marketplace, the MS-65 sells for $200,000, while the AU-58 is generally valued at around $15,000. Photos courtesy of Ira & Larry Goldberg Coins & Collectibles, Inc., Beverly Hills, CA. In the late 1970s, as coin prices escalated dramatically, most notably for pristine, high quality specimens, varying distinctions of "Uncirculated" and "Proof" became evermore critical. Descriptors "Choice" and "Gem" were replaced by numerically assigned grades, utilizing the newly developed 70 point ANA scale, based on a numeric system introduced by Dr. William Sheldon in the 1940s. Uncirculated coins were differentiated as MS-60, MS-65, or MS-70. A few years later, grades MS-63 and MS-67 joined the fray. Although not applied consistently (a situation that gave the coin business a black eye), the practice of assigning a numerical grade to indicate quality was universal by the mid-1980s, and eventually brought some standardization to coin collecting that was absent as the hobby passed through its formative years. Throughout the 1990’s and into the new millennium, more grading subtleties were introduced within the framework of the grading system, such as the wider acceptance of “in-between” grades MS-62 or MS-64, or coin coloration, for example. Though not perfect, the numerical grading system brought more consistency to the coin collecting hobby. Our Coin Value Tables reflect the historic availability of numeric grades to describe coins. The process of coin grading is highly subjective. Even though talent and experience is the key to grading coins accurately on a consistent basis, beginners can come reasonably close to approximating grades with a few simple guidelines. The American Numismatic Association's 0-70 point numeric system is frequently invoked to assign coin grade. The following grades and descriptions are the most recognized milestones on the typical coin grading continuum. About Good AG-3 Very heavily worn with portions of the lettering, date, and legends being worn smooth. The date is barely readable. Good G-4 Heavily worn. Major designs visible, but with faintness in areas. Head of Liberty, wreath, or other major features visible in outline form without center detail. Very Good VG-8 Well worn. Most fine details such as hair strands, leaf details, and so on are worn nearly smooth. The word LIBERTY, if on a shield or headband (seen on 28 coin types), is only partially visible. Fine F-12 Moderate to considerable, even wear. Entire design is bold. All lettering, including the word LIBERTY is visible, with some weaknesses. Very Fine VF-20 Same as Fine except with only moderate wear on the highest points. Choice Very Fine VF-30 Has light even wear on the surfaces, design details on the highest points are lightly worn, but with all lettering and major features sharp. EF-40 Design is lightly worn throughout, but overall, features are sharp and well defined. A bit of luster may show. About Uncirculated AU-50 Has a trace of wear on many of the highest areas. At least half the original mint luster is still present. Choice About Uncirculated AU-55 A coin having less than a trace of wear on only the highest points of the design but no other defects and with most of its luster remaining. Uncirculated MS-60 Has no trace of wear but may show a large number of detracting contact marks and scuffs. Surface may be spotted or lack some luster. Lots of hairlines and rim nicks are permissible. Poor eye appeal is typical. Uncirculated MS-61 Reduced mint luster, contact marks and scuffs scattered throughout. Hairlines may be very noticeable. Small rim nicks are OK. Eye appeal is somewhat unattractive. Uncirculated MS-62 Reduced mint luster may be evident. Groups of small marks throughout, with a few large marks or scuffs highly visible. Scattered hairlines. Rim quality and overall eye appeal below average. Uncirculated MS-63 May have slightly impaired luster. Noticeably fewer defects throughout. A small number of heavy marks are acceptable. Somewhat attractive eye appeal. Uncirculated MS-64 Average mint luster. Several small contact marks in groups and a couple of moderately heavier marks are OK. One or two small hairline patches. Overall eye appeal is good. Uncirculated MS-65 Above average mint luster. Only a few scattered contact marks or two larger marks are present. One or two hairline patches. A few light scuffs on highest points of coin. Quality and eye appeal are above average and quite pleasing. Uncirculated MS-66 Above average mint luster. No more than a few minor contact marks; some in prime focal areas OK. A few hairlines or light scuffs show under magnification. Eye appeal is very good. Uncirculated MS-67 Has almost all of original mint luster. No more than three or four very small contact marks. One or two small hairlines or scuffs acceptable. No distracting flaws allowed. Exceptional eye appeal. Uncirculated MS-68 Full original mint luster. No more than four scattered very small contact marks or flaws, none in focal areas. No visible hairlines or scuff marks. Exceptional eye appeal. Uncirculated MS-69 Very attractive, full mint luster and sharp strike. No more than two small non-detracting marks or flaws. No visible hairlines or scuff marks. Exceptional eye appeal. Uncirculated MS-70 Full original luster of the highest quality. No flaws whatsoever visible, even under 4x magnification. Outstanding eye appeal. The perfect coin. PF A specially made coin distinguished by sharpness of detail and usually with brilliant mirror-like surfaces. Proof refers to the method of manufacture and is not a condition. There are 11 grades of PR coins, ranging from PR-60 to PR-70. Proof PR-60 Unattractive with little if any mirror characteristics. May be large detracting contact marks or damage spots. Heavy hairlines and possible large scuff marks. Rim nicks and poor eye appeal. Proof PR-61 Mirror characteristics diminished or greatly impaired. Large and small contact marks throughout. Lots of detracting hairlines. Unattractive eye appeal. Proof PR-62 Original or impaired mirror characteristics. May have distracting marks in prime focal areas. Hairlines throughout. Marginally acceptable eye appeal. Proof PR-63 Mirror field may be slightly impaired. Numerous small contact marks and a few heavy marks are expected. Many light hairlines are visible without magnification. Moderate eye appeal. Proof PR-64 Fully original mirror fields. May have a fair number of small contact marks, but only one or two heavier marks are acceptable. A few hairlines under low magnification are OK. Pleasing eye appeal. Proof PR-65 High quality mirror surface. A few small scattered contact marked, or two larger marks, are OK. A few hairlines under magnification are visible. Very pleasing eye appeal. Proof PR-66 Full mirror surface and above average quality strike. No more than two or three minor but noticeable contact marks. A few light hairlines may show under magnification. Above average eye appeal. Proof PR-67 Full mirror surface and sharp strike. Three or four tiny contact marks, with one or two in prime focal areas. No hairlines visible to the naked eye. Exceptional eye appeal. Proof PR-68 Full mirror surface and attractive sharp strike. No more than four light scattered flaws. No hairlines. Exceptional eye appeal. Proof PR-69 Full mirror surface and very attractive sharp strike. One or two very small flaws, none in in prime focal areas. Exceptional eye appeal. Proof PR-70 Full mirror surface and highest quality strike. No flaws visible, even under magnification. Outstanding eye appeal. The perfect coin. Modifying Factors After evaluating for wear, other indicators, even more subjective, also contribute towards the coin’s overall grade. These "Modifying Factors", some of which are mentioned above, include eye appeal, quality (i.e. strength) of strike, and blemish location. Other modifying factors are natural toning and coloration. You can learn about them and more in the Coin Jargon glossary. Complaints over inconsistent grading practices reached a crescendo by the mid 1980s. While one dealer might assign a coin a certain grade, another dealer might give the same coin a slightly higher or lower grade. In the numismatic profession, subtle grade differences can mean literally thousands of dollars in trading value. In 1986, PCGS began offering third party grading services, for a fee, to be joined the following year by NGC. Coins submitted to these coin grading companies were evaluated by a panel of experts. Each coin was then encapsulated in a tamper evident container and returned to the sender. By the late 1980s, the coin grading companies captured the trust of the coin industry, at last providing some much desired consistency in grading coins. The impact of the coin grading companies was enormous. Encapsulated coins (known as “slabs” by insiders) became highly liquid commodities, being traded readily by confident buyers and sellers, often sight unseen. This activity won the attention of millions of first-time coin buyers and several Wall Street brokerage firms, pushing the slab market to dizzying heights by the spring of 1989. Eventually, many slabbed coin prices plunged back towards reality as the coin grading companies began releasing their population reports. These reports indicated how many of what types and coin grades passed through their systems, thus revealing a more likely approximation of each coin’s true scarcity. Especially had hit were the common date coins, which even in very high mint state conditions were much more abundant that realized just a few years earlier. In the early 1990’s, the great run-up of the 1980’s crash landed to become nothing more than a memory. Around 1995, the market began a slow ascendancy, then picked up momentum at the very end of the 20th century, and carrying all the way up until today, in spite of a challenging economy. The coin grading companies have forever changed the face of coin trading. Though not perfect, the concept of third party coin grading has proven to be a stabilizing effect and have earned a permanent role in the coin business. There are quite a few coin grading companies operating today. What follows is a list of the most widely known grading services, listed in alphabetical order. Please note the descriptions below were provided by the companies themselves. Grading services that are among the most trusted by experienced numismatists are: ANACS, ICG, NGC, and PCGS, not necessarily in that order. This is not to say that some of the others are not good. For readers who would like to see examples of slabs issued by most of these services and then some, we recommend a visit to a coin grading companies summary page, where photos are placed side-by-side for comparative purposes. ANACS introduced the Clearview™ holder in 2006 to the numismatic community. ANACS received very important feedback from collectors. Based on these ideas and customer needs, ANACS redesigned the Clearview™ holder to the version we use today. On January 1, 2008 ANACS, under its new ownership, relocated from Austin, Texas to suburban Denver. Coins that were certified by ANACS under previous ownership will be reholdered in ANACS's blue label. Coins that were certified since January 1, 2008 under the new ownership, will be reholdered using ANACS's gold label. Global has patented a truly attractive holder which gives you more than a just a grade! Yes, we do give you a grade, but the INFOSLAB also features a quality, state-of-the-art, digital color photograph and an informative paragraph describing each coin along with its grade. And, most importantly, the INFOSLAB truly protects your coins in an attractive holder like no other in the industry! We call our INFOSLAB “The Holder That Communicates” because you get “The Whole Story and Not Just a Grade”! And speaking of grades, Global’s philosophy is that coins should be graded Accurately and Consistently. Independent Coin Grading is a truly independent third party grading service. We grade, authenticate and encapsulate coins, medals and tokens from the U.S. and around the world. ICG’s grading is widely accepted. Our experts are renowned numismatists and doing business with us is easy. Listed on "The Grey Sheet" and "The Blue Sheet." Sonically sealed, tamper-evident, attractive holder with our SECUREGRAMTM hologram system. And, most important ... expert, consistent grading by the most respected names in the business. NCS provides expert professional conservation services for public and private collections of coins, tokens and medals. Coin conservation can help remove harmful residues and stabilize the surface of your coin, revealing the beauty of your most cherished possessions. NGC was founded in 1987, and for coin grading, its opening heralded the introduction of a new standard of integrity. From the beginning NGC focused on only one objective, a standard of consistent and accurate grading. As NGC has grown to become the leader in third-party grading services, we have maintained a steadfast and uncompromising commitment to this standard. The knowledge, integrity and dedication of NGC's team of grading experts ensures you a level of grading consistency unparalleled among grading services. This record of consistency, built over the years, has helped to foster greater stability throughout the rare coin marketplace. NGC is the official grading service of the American Numismatic Association. NNC is an independent third-party coin grading service which does not buy or sell coins, nor does NNC appraise coins in terms of monetary value. National Numismatic Certification, LLC. cannot guarantee the liquidity of any coin graded by NNC. NNC certification of a particular coin cannot provide protection from the risks inherent in any market for such coins, if such a market exists. With over 17 million coins graded commanding a total value over $18 billion, PCGS represents the industry standard in third-party certification. When you choose PCGS, you get: (1) Our money-back guarantee of grading accuracy and authenticity (2) Incomparable value – PCGS-certified coins are known for realizing the prices they deserve. SEGS is your exceptional choice in numismatic grading services. Our consultants, contributing editors, educators and staff of specialists are among the most renowned in the numismatic industry. When you select SEGS as your rare coin grading service you can expect the highest degree of numismatic skill will be utilized while authenticating and grading your collectible coins. SEGS offers complete attribution and designation options. Our team is especially knowledgeable in the areas of variety attribution including all the major recognized error designations. SEGS is also proud to offer the the best and most innovative coin holder in the industry. In addition to an airtight isolated compartment we also offer you the benefit of our exclusive top view labeling design.